Machines for the Production of Road Construction Emulsions - GlobeCore. Oil Purification Systems. Bitumen for road repairs and construction can be used in the form of a water emulsion. Beside bitumen and water, the emulsion contains a small amount (2-5%) of surfactant that prevents the bitumen droplets from coagulating. Tar, sulfate soap, soap stock, acidol and a few others chemicals are used as surfactants. When mineral materials contact the emulsion, the latter separate, and bitumen sticks to the mineral surface, and the water evaporates. Depending on the rate of emulsion breaking, they are classified as fast, medium or slow breaking emulsions. Unlike hot bitumen, emulsions are applied when cold. Therefore, emulsions can be used in cold weather on wet stone materials, thus extending the road construction season and increase the efficiency of machinery use. Emulsions can reduce the consumption of the binding material as much as 30-35%. Regular machines are used for road construction with bitumen emulsions. Compaction of the such layers with rollers must be complete before the emulsion starts to separate. There are several methods of emulsification: mechanical, acoustic, chemical etc. In any case, physical factors which depend on bitumen and surfactant concentrations, temperature, the technology etc are important. In the case of mechanical emulsification, bitumen is pulverized by physical forces, such as shock, shear, compression, friction etc. Acoustic emulsification involves the influence of sonic and ultrasonic waves on the liquids which causes pressure difference in the body of the materials to shear them. Chemically, high molecular acids reduce the interphase tension on the boundary between water and bitumen, so that breaking of bitumen droplets occurs naturally with small effort,, such as a simple shake of pneumatic mixing. Emulsion is made in emulsification machines, also referred to as homogenizers, dispersers, colloid mills etc. Some auxiliary equipment is also required. 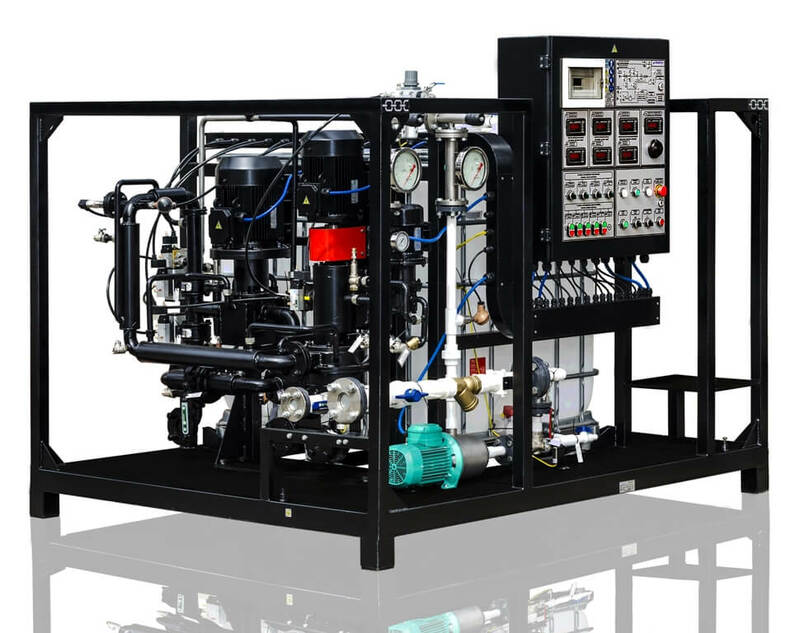 The emulsion production equipment usually includes all necessary components. Bitumen dehydration and heating is usually performed in bitumen boilers. Emulsifier is prepared in heated vessels. The machinery is equipped with a homogenizer, vessels for the water phase, emulsion storage tanks and water softening equipment. 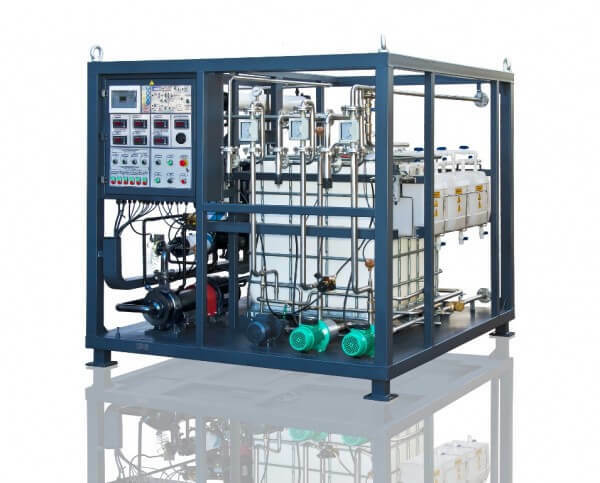 The emulsifier is diluted with water and is pumped to tanks for heating to 70-80°С. From there, the water phase is pumped into the homogenizer, along with bitumen at 140-150°С, supplied from bitumen boilers by bitumen pumps. The emulsion flows continuously from the homogenizer into storage tanks. 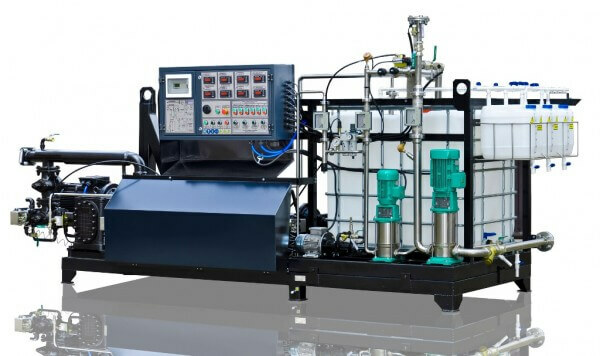 The concentration of bitumen in the emulsion is managed either manually or by automatically adjusting supply rates of bitumen and the water phase.